Pastoral Care Update: Naella Grew goes to No.10 Downing Street! The Doon School was the first school, (boarding or day) located outside of the UK, which Mrs Grew came to work at six years ago. Her work supports the school’s pastoral care curriculum and the SEAL programme that is also offered in the UK. Mrs Grew has worked with boys, staff and parents on her visits to The Doon School which she makes throughout the academic year. Her book Teenagers Translate, hit the Amazon best seller list in 2015 and is on a second reprint. She now works in schools in the Middle East as well as Europe in addition to Doon’s peer group of schools in the UK who are in membership of HMC and IBSC. 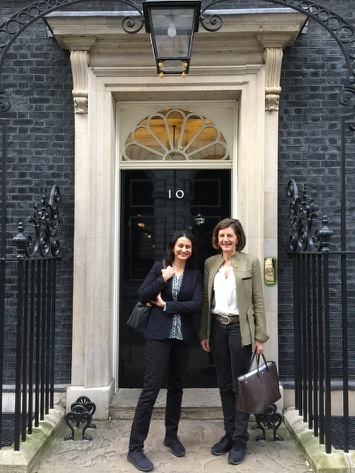 Naella is pictured here with her colleague going to the British Prime Minister’s house to talk to a UK government select committee about the importance of teaching emotional and mental health in schools. It is great news that Doon got her first!